COMPLAINT FILED UNDER SECTION 154 OF C.R.P.C. I am residing in the above said address, I have leased out my house properties bearing Door No. 12 & 13 at Goubert Avenue (Beach Road), Pondicherry, No. 13 at Saint Louis Street, Pondicherry, and No. 3, Lai Bahadur Shastri Street, Pondicherry to Sri Aurobindo Ashram Trust, Pondicherry for a monthly rent of Rs. 10,000/- in total for the said premises. The premises has been let out to the said Sri Aurobindo Ashram Trust 30 years back. 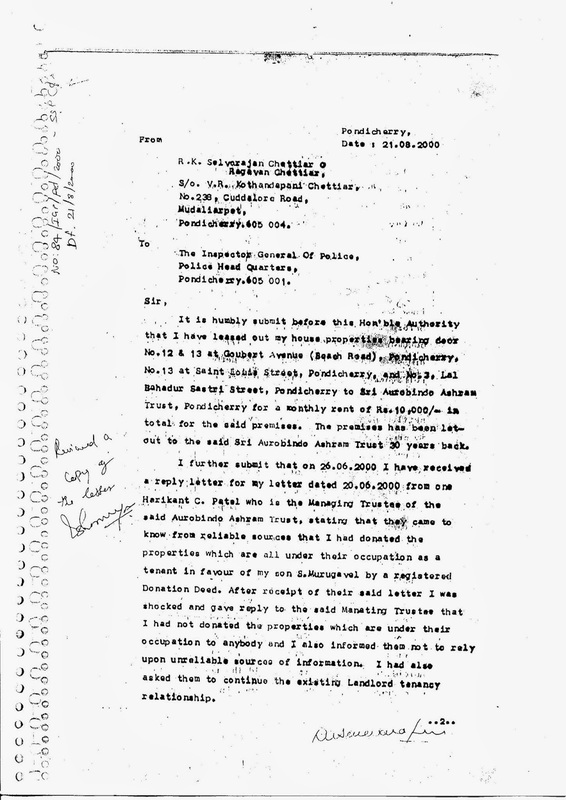 I further submit that on 26.06.2000 I have received a reply letter for my letter dated 20.06.2000 from one Harikant C. Patel who is the Managing Trustee of the said Aurobindo Ashram Trust, stating that they came to know from reliable sources that I had donated the properties which are all under their occupation as a tenant in favour of my son S. Murugavel by a registered donation Deed. After receipt of their said letter, I was shocked and gave reply to the said Managing Trustee that I had not donated the properties which are under their occupation to anybody and I also informed them not to rely upon unreliable sources of information. I had also asked them to continue the existing Landlord tenancy relationship. 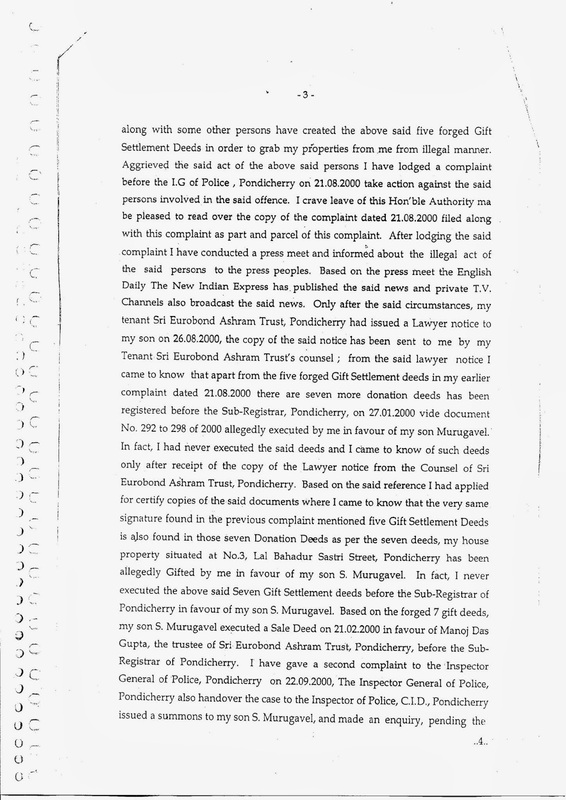 I further submit that after receipt of the said reply letter I had verified before the Sub-Registrar of Pondicherry and come to know that Five Gift Settlement deeds had been registered as if I had executed the same in favour of my son Murugavel. 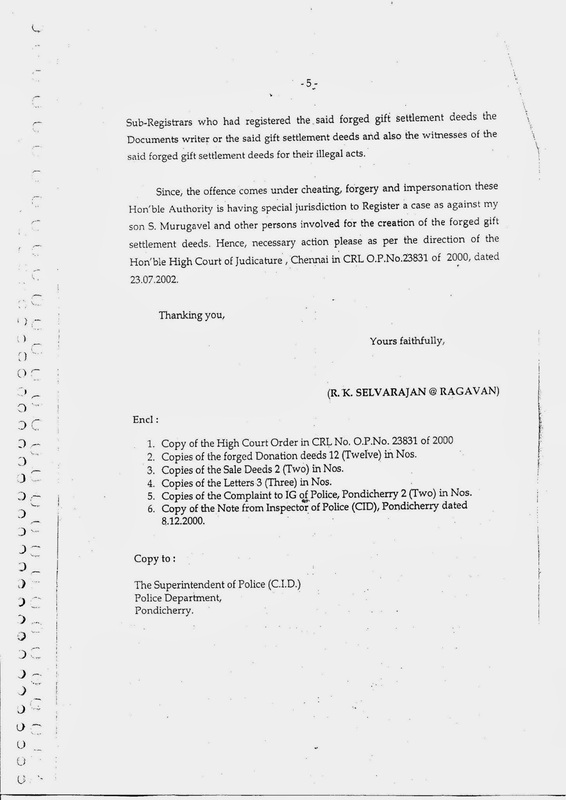 In fact, I have never executed any such Gift Settlement Deeds in favour of my son S. Murugavel. Hence I applied for the certified photo copies of those Deeds. After receipt of the said documents I had perused those documents, where I came to know that five Gift Settlement Deeds had been registered before the Sub-Registrar, Pondicherry on 25.11.1999 vide document Nos. 5774/99, 5775/99, 5776/99, 5777/99, 5778/99 and the beneficiary of the said Forgery documents had impersonated me before the Sub-Registrar, Pondicherry and forged my signature in those documents. I further submit that based on the said forged Gift Settlement deeds my son Murugavel, claiming title over my properties had executed a Sale Deed on 28.12.99 vide document No. 6190/99 registered before the Sub-Registrar, Pondicherry in favour of one Manoj Das Gupta, son of Narendra Nath Dass Gupta, residing at No. 23, St. Louis Street, Pondicherry. The said Manoj Das Gupta had purchased two items of the above said properties (i.e.) Door No. 12 & 13 of Goubert Avenue, Pondicherry and No. 13 of Saint Louis Street, Pondicherry in the capacity of Trustee of Sri Aurobindo Ashram Trust, Pondicherry. I further submit that even though the above said Sale Deed had been executed that even on 28.12.1999, in favour of the said Aurobindo Ashram Trust, they had not informed about the said transaction to me, whereas the said Aurobindo Ashram Trust had paid the rent without fail up to June 2000. In the meantime, in the month of January 2000 the said Aurobindo Ashram Trust requested me to renovate the building at No.13, Saint Louis Street, Pondicherry and attend certain repair works. I had also complied with their request and wrote a letter to the Aurobindo Ashram Trust on 20.06.2000 inviting them for discussion about the increase of rent. 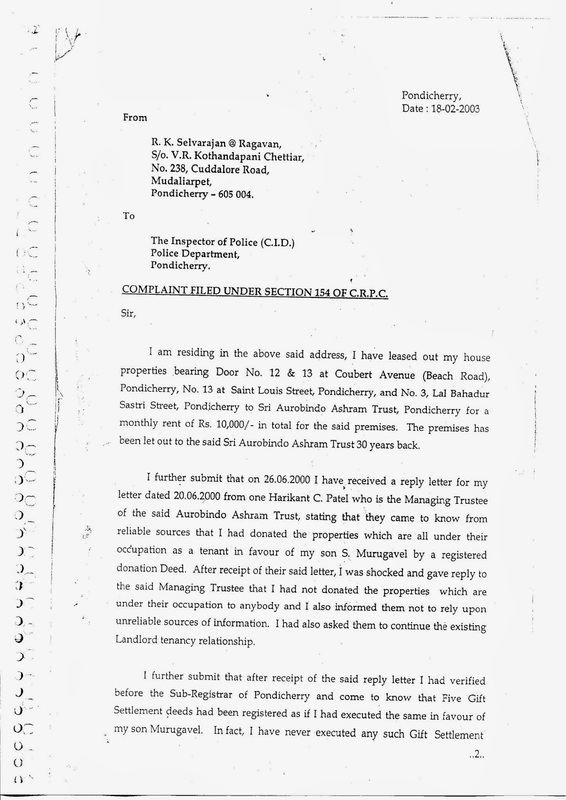 For the said letter the Aurobindo Ashram Trust gave a reply on 26.06.2000 which had already been referred above in this complaint. 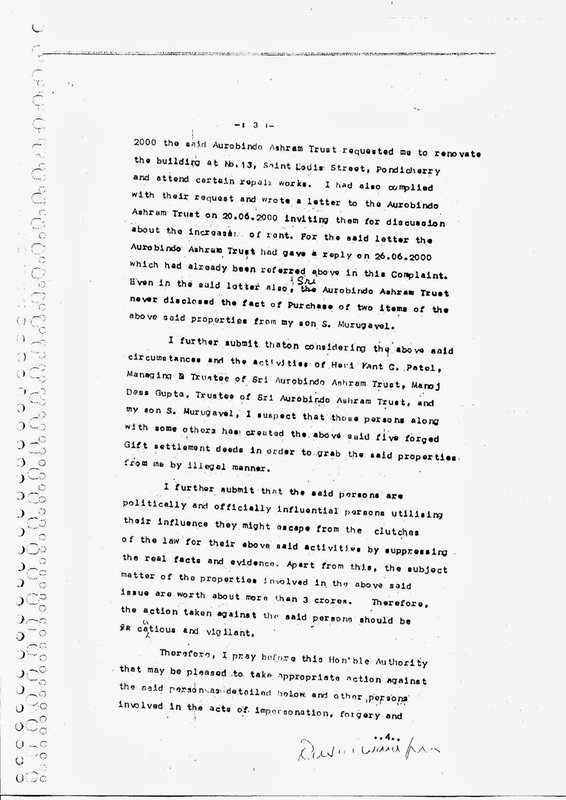 Even in the said letter also, Sri Aurobindo Ashram Trust never disclosed the fact of purchase of two items of the above properties from my son S. Murugavel. I further submit that considering the above said circumstances I have strongly suspected that the said five donation deeds has been created forgerily by impersonation before the registrar in order to cheat me and grab my properties from me by the Sri Aurobindo Ashram Trust and my son S. Murugavel along with some other persons have created the above said five forged Gift Settlement Deeds in order to grab my properties from me from illegal manner. Aggrieved by the said act of the above said persons I have lodged a complaint before the I.G of Police, Pondicherry on 21.08.2000 to take action against the said persons involved in the said offence. I crave leave of this Hon'ble Authority may be pleased to read over the copy of the complaint dated 21.08.2000 filed along with this complaint as part and parcel of this complaint. After lodging the said complaint I have conducted a press meet and informed about the illegal act of the said persons to the press peoples. Based on the press meet the English Daily The New Indian Express has published the said news and private T.V. Channels also broadcast the said news. Only after the said circumstances, my tenant Sri Aurobindo Ashram Trust, Pondicherry had issued a Lawyer notice to my son on 26.08.2000, the copy of the said notice has been sent to me by my Tenant Sri Aurobindo Ashram Trust's counsel; from the said lawyer notice I came to know that apart from the five forged Gift Settlement deeds in my earlier complaint dated 21.08.2000 there are seven more donation deeds have been registered before the Sub-Registrar, Pondicherry, on 27.01.2000 vide document No. 292 to 298 of 2000 allegedly executed by me in favour of my son Murugavel. In fact, I had never executed the said deeds and I came to know of such deeds only after receipt of the copy of the Lawyer notice from the Counsel of Sri Aurobindo Ashram Trust, Pondicherry. 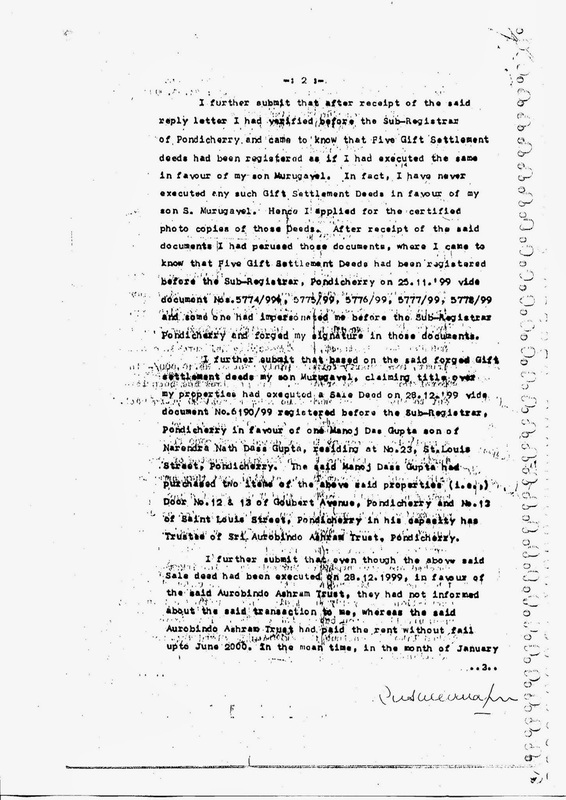 Based on the said reference I had applied for certify copies of the said documents where I came to know that the very same signature found in the previous complaint mentioned five Gift Settlement Deeds is also found in those seven Donation Deeds as per the seven deeds, my house property situated at No.3, Lal Bahadur Sastri Street, Pondicherry has been allegedly Gifted by me in favour of my son S. Murugavel. In fact, I never executed the above said Seven Gift Settlement deeds before the Sub-Registrar of Pondicherry in favour of my son S. Murugavel. 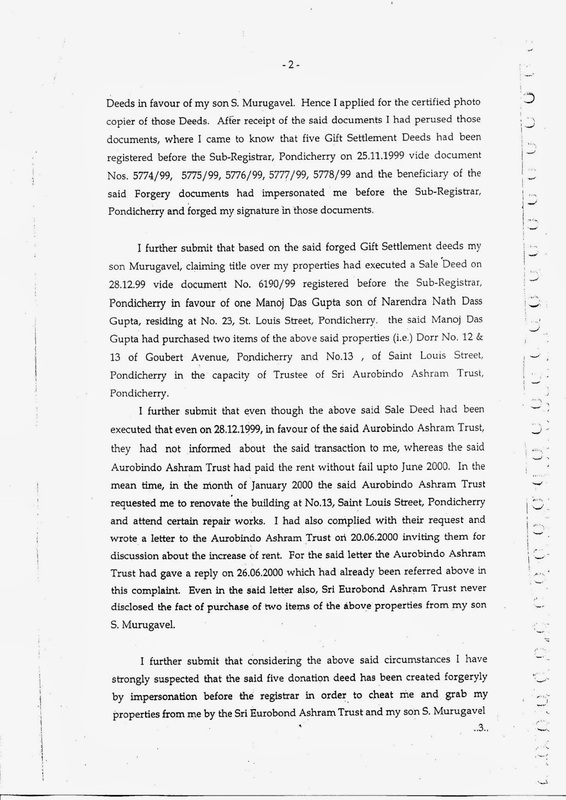 Based on the forged 7 gift deeds, my son S. Murugavel executed a Sale Deed on 21.02.2000 in favour of Manoj Das Gupta, the trustee of Sri Aurobindo Ashram Trust, Pondicherry, before the Sub-Registrar of Pondicherry. I have gave a second complaint to the Inspector General of Police, Pondicherry on 22.09.2000, The Inspector General of Police, Pondicherry to also hand over the case to the Inspector of Police, C.I.D., Pondicherry issued a summons to my son S. Murugavel, and made an enquiry, pending the said enquiry, in order to escape from the clutches of the Criminal liabilities my son S. Murugavel had filed a Private Complaint before the Sub-Divisional Judicial Magistrate Court, Pondicherry in C.C. No. 338 of 2000 under section 211, 500, 506 of IPC and he had also filed a suit for damage in O.S. No. 389/2000 before the Additional Sub-Judge Court, Pondicherry. I further submit that since the Inspector of Police C.I.D. has not completed his enquiry in time, I have filed a Criminal O.P .No. 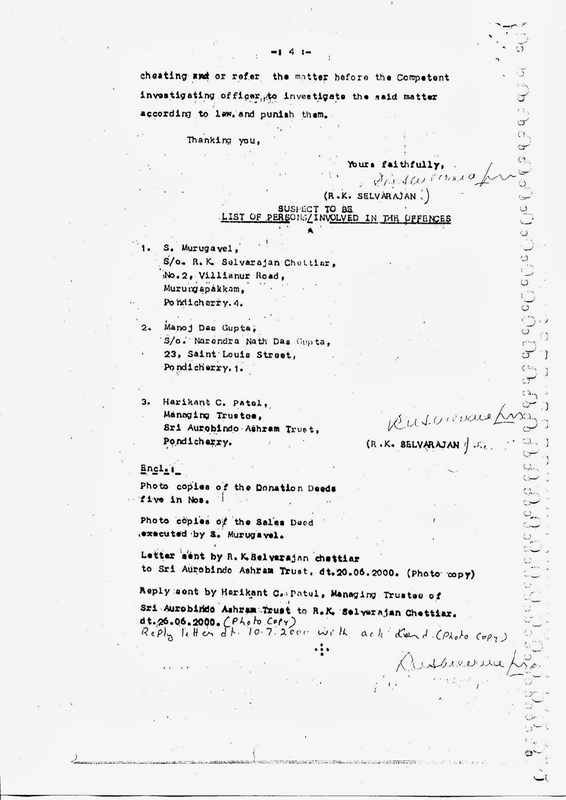 23831 of 2000 before the High Court of Judicature, Madras. Pending the said O.P. the Inspector of Police, C.I.D. gave a note that no case will be Registered against my son S. Murugavel, and he also advised me that I have to report about the forgery impersonation before the District Registrar, Pondicherry. 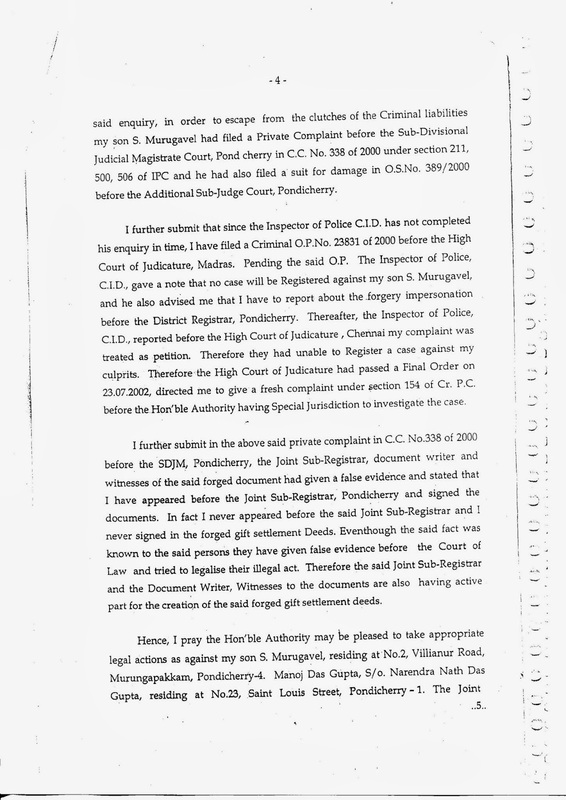 Thereafter, the Inspector of Police, C.I.D., reported before the High Court of Judicature, Chennai my complaint was treated as petition. Therefore they had unable to register a case against my culprits. Therefore the High Court of Judicature had passed a Final Order on 23.07.2002, directed me to give a fresh complaint under section 154 of Cr. P.C. before the Hon'ble Authority having Special Jurisdiction to investigate the case. I further submit in the above said private complaint in C.C. No.338 of 2000 before the SDJM, Pondicherry, the Joint Sub-Registrar, document writer and witnesses of the said forged document had given a false evidence and stated that I have appeared before the Joint Sub-Registrar, Pondicherry and signed the documents. In fact I never appeared before the said Joint Sub-Registrar and I never signed in the forged gift settlement Deeds. Even though the said fact was known to the said persons they have given false evidence before the Court of Law and tried to legalise their illegal act. Therefore the said Joint Sub-Registrar and the Document Writer, Witnesses to the documents are also having active part for the creation of the said forged gift settlement deeds. Hence, I pray the Hon'ble Authority may be pleased to take appropriate legal actions as against my son S. Murugavel, residing at No. 2, Villianur Road, Murungapakkam, Pondicherry-4, Manoj Das Gupta, S/o. Narendra Nath Das Gupta, residing at No.23, Saint Louis Street, Pondicherry -1. The Joint Sub-Registrars who had registered the said forged gift settlement deeds the Documents writer or the said gift settlement deeds and also the witnesses of the said forged gift settlement deeds for their illegal acts. Since, the offence comes under cheating, forgery and impersonation the Hon'ble Authority is having special jurisdiction to Register a case as against my son S. Murugavel and other persons involved for the creation of the forged gift settlement deeds. Hence, necessary action please as per the direction of the Hon'ble High Court of Judicature , Chennai in CRL O.P.No.23831 of 2000, dated 23.07.2002.